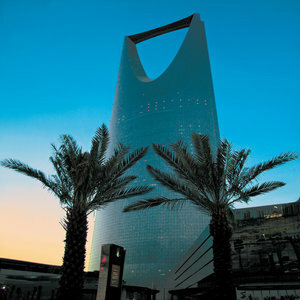 The Four Seasons Hotel riyadh is located at the city s most prestigious address - The Kingdom Centre - close to the commercial and diplomatic quarters. The hotel provides a sophisticated haven for travellers on the 30-48 floors of the luxury shopping and residential tower. Minimum age to reserve a room is 18 years. Guests who arrive prior to normal check-in time of 15.00Hrs and want immediate access to their room should reserve the night prior to arrival. Luxurious Four Seasons comfort and intuitive services within the distinctive profile of the prestigious Kingdom Centre. Close to the key sites for business, as well as arts, culture and shopping â modern boutiques to open-air markets. In an effort to help women travelling to Riyadh feel comfortable and secure, Four Seasons Hotel Riyadh at Kingdom Centre has created The Pearl Floor, a women*s only floor consisting of 22 Premium Rooms and two Four Seasons Executive Suites, both of which feature an exclusive express check-in desk. Managed by a team of experienced female staff, this area provides personalized, trustworthy service to put our female guests at ease during their stay. The opulent Pearl Floor lobby features a beautiful sweeping staircase as well as newly designed bathroom vanities. All rooms and suites are elegantly decorated with warm residential ambience, and are furnished with the finest linens and duvets, complemented by breathtaking views of Riyadh. The floor also includes a modern women*s only lounge with spectacular views of Riyadh city, where guests can access free Wi-Fi and complimentary refreshments, as well as our new and exclusive state-of-the-art ladies gym.